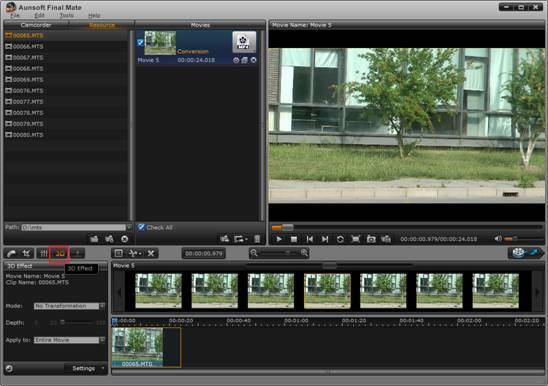 Do you want to watch your own camcorder footages in 3D effects? Do you have to buy a 3D effects camcorder? Or you just need a 2D video to 3D video converter? More and more HD 3D camcorders have been provided by well-known camcorder manufacturers, such as Panasonic, Sony and Canon, etc. But as a new visual technology, such a camcorder would be quite expensive. For example, Panasonic HDC-SDT750, the flag model by Panasonic, is $1,279.00 on Amazon; Sony Handycam HDR-TD10 is $1,039.00; Canon's XF305 and XF300 pro camcorders can now shoot in 3D, but they are all professional models and shot in MXF format; both of them are far more expensive than AVCHD (Lite) files shooting cameras. So for those Camcorder fans who have got used to shoot with their own AVCHD (Lite) camcorders, it would be smart to have a 2D to 3D movie conversion program, which can help you convert the AVCHD footages from 2D to 3D. Aunsoft Final Mate (Windows and Mac version are all available), the flag product of Aunsoft Studio, can just help you complete such a job, 2D to 3D conversion job, transforming 2D MTS file to 3D. The following steps will just show you how to convert 2D MTS movies to 3D by Aunsoft Final Mate. 1. After launching the program and get the original AVCHD (Lite) MTS files loaded into the Source list, you need create a conversion movie. 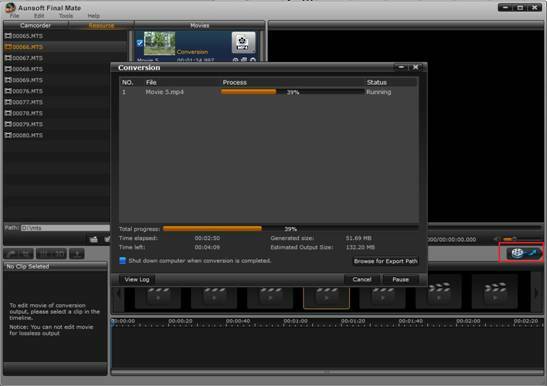 Please note that the 3D effects can only be encoded in Conversion movie, not for Lossless output. The Shortcut key Ctrl+Shift+O is valid to complete the conversion movie creation. 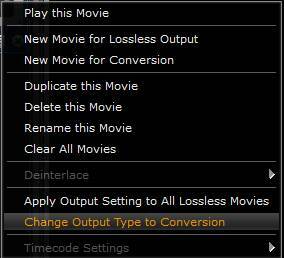 Tips: You can also create a conversion movie by right-clicking in the Movie list; even if you have created a lossless movie, you can change the type of the movie by the option, "Change Output Type to Conversion" in the Right-click menu. 2. 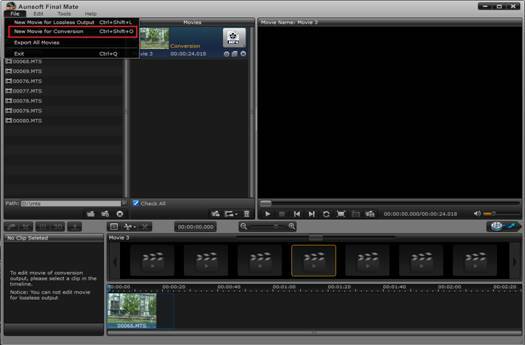 Highlight the movie on the Time-line so that the 3D Effect button on the Editing panel can be active. All the 3D mode and 3D Settings will be shown on the panel after you click this button. In the Aunsoft Final Mate, we offer two types of 3D modes, Red/Blue and Red/Green, different in what types of 3D glasses is required in watching the movie. After you select one of them, you will be able to know what the output will be in the Preview part of the program. And also, you can adjust the "Depth" of the 3D Effects, the value is available from 20 to 100. Different values for this option will provide you different 3D effects and the changes can be shown in the Preview playback. The 3D Effects can also be applied to the "selected clips" on the Time-line or the "Entire Movie". 4. 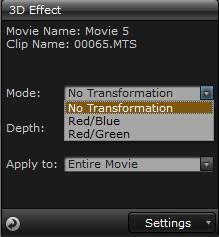 After you get the 3D effect you like, click "Export" button to get the movie converted from 2D to 3D. Worry about the conversion speed? Aunsoft Final Mate will help you avoid such an important problem. In the program, we have integrated into many advanced GPU Acceleration technologies performed by different Decoders, such as Nvidia CUDA, AMD APP and Intel Decoders. Even on iMac, in the Aunsoft Final Mate for Mac, you can full-utilize your CPU cores to assure the 50% faster conversion speed than other converters. What to do next after the conversion is done? Enjoy the 3D movies created by your own Camcorder footages! It is fantastic! So by Aunsoft Final Mate, you can convert your 2D video to 3D movie within a few steps, and it is a powerful and easy-to-use 2d to 3d video converter software. How to put and play Movie/Music on Sumsung Fascinate? How to Convert AVCHD Camcorder MTS/M2TS Videos to After Effects? How to Convert AVCHD Camcorder MTS/M2TS Video to Adobe Premiere?